A daylily is a herbaceous perennial, flowering garden plant that belongs to the specific genus the Hemerocallis, which comes from the Greek words (hemera) “day” and (kalos) “beautiful”. Hemerocallis belongs in their own plant family Xanthorrhoeaceae, subfamily of Hemerocallidaceae. Daylilies have a six week long flowering season with most flowers that open for one day. At flowering time, large daylily clumps bear an abundance of showy flowers during spring to early summer. Daylilies can also rebloom in autumn in Australia. The daylily is considered to be a monocot as well as a monoecious. Daylilies are also said to be the perfect perennial plant that bring you all colours of the rainbow in different shapes, heights and sizes. Daylilies do grow in most places in Australia and around the world. Daylilies in Australia are sometimes mistaken to be classified as lilies but they are actually not. The basic plant is often called a fan. The genus Hemerocallis is native to Asia, for years hybridisers from United States even Australia have made excellent improvements in daylilies since the Hemerocallis fulva was first introduced from Asia in the 1930’s as an ornamental flower in the garden or seen growing along the roadside as a weed. Daylily Leaves – When it comes to appearance, the leaves of dayliles are long and slender and grow from the daylily crown like a fountain of grass, in one word this is called distichous, tapering gradually to a sword like point, these leaves can range from green to have a bluish green look, depending on the daylily variety. One of the main factors to consider before you buy a daylily is the height of the plant whether you want the plant to be low or tall growing. The height of a daylily is measured by the height of the flower scapes and not by the foliage height for example Daylily Dream Candy has a Height 26in (66cm). The scapes appear from the side or inbetween the foliage at the base of the daylily plant. The scapes are categorised as low growing scapes up to 24’’ – medium growing scapes 24’’ to 36’’ and tall growing scapes over 36’’ – dwarf daylilies have scapes that grow under 12’’. The scapes or stems of the daylily usually grow taller than the daylily leaves which have several flower buds, sometimes the scapes can have proliferations or tiny daylilies that grow on the scape at the same time that the daylily is flowering, this is an exact clone of the daylily that the proliferations are grown on, this is a form of daylily propagation. Daylilies usually send up one bloom stalk per fan and later on rebloom. The Growth of a daylily can be slow or can be vigorous. Daylilies have fibrous roots, where the roots and foliage meet this is called the crown it is usually white in colour because the crown of the daylily is usually covered with dirt when the daylily is planted. Daylilies are suited to pot culture, when the daylilies are grown in containers, they should be grown in deep pots to allow for a adequate root run. The daylily flower has three categories of flower sizes the flowers are measured in diameter, miniature the flowers are less than 3’’ small flowered daylilies are between 3’’ and 4.5’’ and the large flowered daylilies are more than 4.5’. CIRCULAR – these daylily blooms are circular round shaped blooms. TRIANGULAR blooms are triangular in shape, flower segments form a triangle, the sepals usually recurve. STAR – star shaped blooms, segments are long and pointed with a space between the segments, shaped like a three pointed or six pointed star. RECURVED – this is when the flower ends curl or roll back. PINCHED – the flower is pinched, like someone has held it between two fingers. RUFFLED – has a ripple edge to the petals. SELF – petals and sepals are all the one colour. BLEND – petals and sepals are a blend of two or more colours. POLYCHROME – a beautiful colour shadings on the flowers. BITONE – petals and sepals different shade or intensity of the same basic colour. Reverse Bitone is when the has sepals are darker than the petals. BICOLOUR – petals and sepals are of different colours. EYE-ZONE – is a darker coloured zone on the petal and sepals of the daylily flower above the throat. BAND – If the darker colour is only on the petals. HALO – If it the markings are only light in colour. WATERMARK – If the markings are very wide and spread out solid over the petals. EDGING OR PICOTEED – this can be wide or have a wire edge. MIDRIB – this is the centre vein running lengthwise through the middle of the petal this can be a different colour. DIAMOND OR GOLD DUSTING – Dusting effect this can be gold or diamond dusting these are tiny crystals in the cell of the flower that reflect in the sun which gives the flower a sparkle. THROAT – the very center or core of the flower may have a green or other colour which is different from the flower. HOSE IN HOSE – a daylily doubles have extra whorls or layers of petals. POLYMEROUS – a daylily that has more segments in each floral whorl, more than three sepals sometimes having 4 or even 5 in the outer whorl the daylily usually has the same amount of sepals in the inner whorl aside from this polymerous daylilies also have extra stamens but they have the same amount of carpels and pistil.Refers to the daylily flowers later in the year on the same plant, REBLOOM – the rebloom flowers are never as good as the first bloom, daylilies flower in Australia November and December on their first bloom, the daylily plant can rebloom any other time of the year after it blooms the first time. For the daylily plant to rebloom it has to flower twice in one year. Extended Bloom – The daylily flowers that stay open for more than 16 hours. Nocturnal Daylilies – These nocturnal daylily flowers are known to bloom at night these. Nocturnal daylilies open late in the day and stay open deep in the night and part of the following day this means these blooms are also extended bloomers because they are open more than 16 hours. An example of a nocturnal daylily is the species Hemerocallis citrina, this daylily was introduced from China and is very popular with gardeners everywhere. The landscape daylily Happy Returns is a nocturnal bloomer as it starts opening at night and flowers all day. You have to watch the blooms of the daylily flowers that open in the night for snails and slugs otherwise come morning the flowers will be shredded the snails and slugs will have already munched on the flowers as this is when the daylily pests feed and hide during the day. 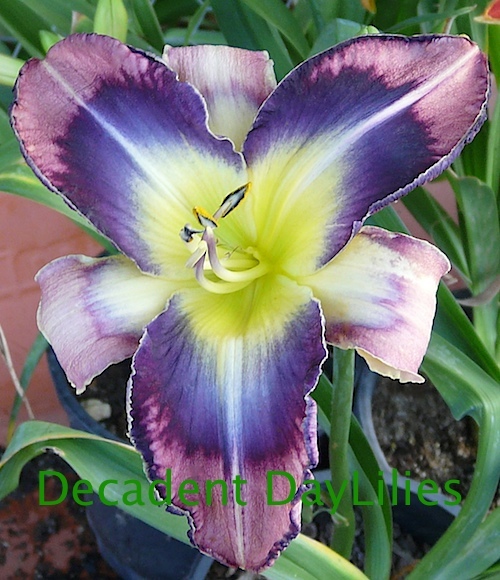 Nocturnal daylilies are not available in nurseries in Australia, you will have to go to a specialist daylily nursery to buy these special daylilies. DOUBLE DAYLILIES – these daylilies have extra petals, there are peony type doubles that have petal like stamens inside the normal petal whorl. The carpels may also be petaloid. Another double daylily is the Hose in Hose – another form of double daylilies these have petal-like tissue on the stamens inside the normal petal whorl. MULTIFORM – Is a daylily that is both a spider and a unusual form daylily this daylily can be a polymerous double as well. SPIDERS and UNUSUAL FORMS DAYLILIES – Cascade, Spatualate and Crispate these are types of spider dayllies. SINGLE DAYLILIES – Single flowered daylilies. DWARF DAYLILIES – A daylily that grows less than 12 inches in height. Water is most important when growing daylilies they need sufficient water leading up to the daylilies flowering in spring, this will ensure that you get the most blooms and the biggest and brightest blooms as possible, if you fail to do this your daylily flowers will be pretty ordinary. Daylilies need a deep watering at least twice a week, for best results daylilies like damp soil. The Ploidy classification of the terms Diploid (dip) and Tetraploid (tet) refer to the number of pairs of chromosomes this is very useful if you are hybridising daylilies. From the original H. flava and Wilsons yellow the daylily hybrids have come along way thanks to the hybridisers, daylilies now have the full range of colours except for pure white and a real true blue is still a hybridiser dream, hybridisers are succeeding with blue in the eye-zones of daylilies. The seed capsules are produced in a three compartments within the pod with black seeds when they are ripe. Seeds produced from daylilies will not be exact same as the parent flowers, the seeds will only exhibit traits of both parents hybridised, this will make the new seedlings new and unique. Too much fertiliser can harm the daylilies it is best to fertilise often in small amounts it can also affect the bloom count and if given lots of fertiliser can kill the daylily by rotting the roots. Do not fertilise too early in the spring, otherwise your plants will grow quickly only to be damaged by a late frost. This can lead to a condition called daylily spring sickness in daylilies. Manure is a great soil conditioner, you have to make sure that the manure is well rotted before you use it and the worms seem to do a great job in mixing the manure with the other materials together to make the best organic compost for daylilies. Not all daylilies are fragrant and they are certainly not as fragrant as roses, you have to be close by to smell the scented daylilies aside from this it is said that daylilies Happy Returns, Hemerocallis Fragrant Returns and daylily Pardon Me all have a lovely sweet fragrance nevertheless the modern daylily New Paradigm is highly fragrant as well the most fragrant in my daylily garden for 2013. Here are some of the most practical things that you can learn about daylilies, you can learn more by clicking on the picture link below.